Empire Comfort Systems grew out of a small sheet metal shop founded by Henry Bauer in 1911 in the city of Belleville, Illinois. Formally incorporated on August 26, 1932, Empire Stove Company produced sheet metal heaters that took advantage of the increasing availability of natural gas. While the company has weathered the ups and downs of economic downturns, wars, labor strife, fires, and societal changes, the Bauer family has remained the one constant. The family tradition continues. Nick Bauer and Jane Bauer represent the fourth generation of Bauer’s at Empire Comfort Systems – making this a continuously family-operated business since 1932. Empire was the first to market vent-free heaters equipped with an Oxygen Depletion Sensor, now standard on all vent-free products in the U.S. In the 1980s, Empire became the first to market a gas-fired heater that achieves 80-percent efficiency, and in 2006, Empire marketed the first vented gas fireplace to achieve 90-percent efficiency. 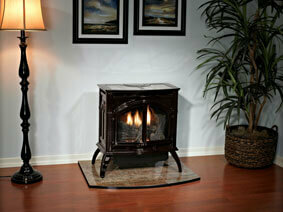 Today’s heater and hearth offerings cover a wide spectrum of gas-fired products. For over a century, Empire has been providing opportunities for employees and suppliers. Empire’s heaters, fireplaces and grills are assembled at the company’s two manufacturing facilities in Belleville, Illinois, just outside of St. Louis. Wherever possible, the company gives preference to North American suppliers.